This blog isn’t about me or my jewelry design company, Naked-Jewelry, but every once in a while when I hit a milestone, I want to take a moment and share. This past weekend, I did my first art/craft fair. What an experience that was! To prepare, I exhausted my computer with all that I ordered online…from a canopy to folding tables and chairs…even one of those little portable credit card machines and a battery operated fan. This list seemed endless! My wonderful husband, Tom, got in the spirit and helped me transport, put up and tear down this extravaganza and while we both saw some tweaks for next time, we were pretty happy with the result and decided that we compared quite favorably to the competition! And, we even made some sales! Yahoo! 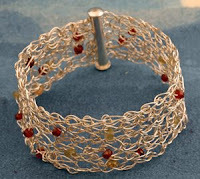 My hand wire-crochet designs, especially the cuff bracelets seem to be the hot sellers so I’m thinking of other ways to extend that idea further. 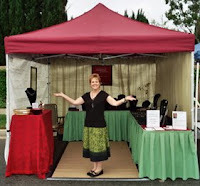 By the way, in getting the booth together, I followed the advice from Rena Klingenberg’s Ultimate Guide to Your Profitable Jewelry Booth, which was invaluable in its detail and recommendations from years of experience. I welcome your feedback on your own experience as to what works and what doesn’t hit the mark. 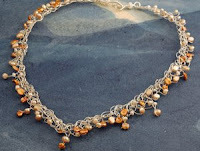 Thank you for your ongoing support of all the truly incredible jewelry designers featured here. I’m most definitely still a newbie, but am learning a tremendous amount from these talented people.